MTV may not show videos anymore, but at least rockers on the promotional trail can always count on ... Ellen DeGeneres? They are what "Dreams" are made of. A legendary “Unchained” world renowned rock band that continues to tear up the stage four decades since their beginning. Van Halen is here! In a daytime exclusive, the California rockers will take over Ellen’s stage to perform one of their favorite songs as they embark on their Greatest Hits Tour! They’re some of the most talented, wildest and most exciting musicians of all time. Nearly all of Van Halen’s albums have gone triple platinum, featuring iconic songs like “You Really Got Me,” “Runnin’ With the Devil” and “Dancing in the Street.” Ellen and her audience will be dancing through the aisles when Van Halen brings the heat to the room! 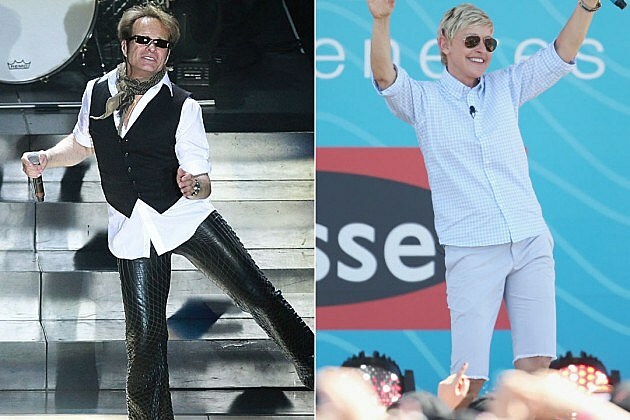 The "Cradle Will Rock" this Thursday on Ellen! While the band has yet to announce any tour dates, Eddie Van Halen has made recent rumblings about being ready to get back on the road, and given that they've been sidelined since their shortened Viva Van Halen Tour in 2012-13, the timing could be right for another round of live dates (provided that Wolfgang Van Halen can tear himself away from Tremonti and his solo album). In the meantime, the band has debuted a handful of Tokyo Dome cuts in advance of the album's release. Check out the latest, "Unchained," below.